From its incendiary opening to its somber but exultant conclusion, Spike Lee's grand and important film "Malcolm X" captures the life of a complex, charismatic and gravely misunderstood man who fought for human rights and justice for Africans and African-Americans. The film, based on The Autobiography of Malcolm X as told to Alex Haley, is arguably Mr. Lee's best and most universal film, and one of the great American film biographies. For context, "Malcolm X" had extraordinary publicity leading up to its 1991 production. Numerous black activists in New York City and elsewhere had forecasted that Mr. Lee's film would not accurately depict the essence of Malcolm. "Don't mess Malcolm up," was a refrain the director heard over and over again. "Malcolm X" was released in New York City on November 18, 1992, two weeks and one day after Bill Clinton was first elected president. (Full disclosure: a year earlier I was an extra on "Malcolm X.") 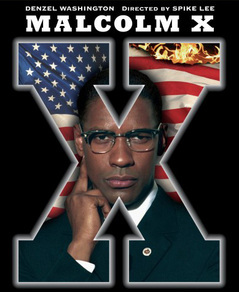 When a t-shirt designed by Mr. Lee's 40 Acres and A Mule Filmworks' apparel company was released in early 1992 depicting an "X" carved out of an American flag, some suspected that the Brooklyn-based director was going to be an agent in co-opting Malcolm's political and historical legacy. 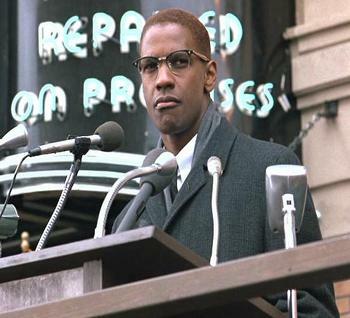 Denzel Washington's career-making performance as Malcolm Little, who evolved many times during a brief 39 year-life, electrifies Mr. Lee's classic, sweeping epic. Mr. Washington renders an excellent portrayal, the most complete acting of his career, playing a multifaceted man: hustler, thief, prisoner, minister, orator, Black Nationalist and justice-seeker, Pan-African leader and devout student of Islam. For his remarkable work Mr. Washington won the Berlinale Silver Bear Best Actor award in 1993 but lost out at the Academy Awards that year. Martin Scorsese once hailed Mr. Washington's performance as Malcolm X as "one of the best in American movies ...phenomenal." To this day Mr. Lee still wonders aloud how Mr. Washington didn't win an Oscar. (He's not the only one.) The role of Malcolm X was not an unfamiliar one to the Mount Vernon, NY-born Washington, who had played Malcolm X Off-Broadway in 1981 in the play "When The Chickens Came Home To Roost." As beautifully photographed by Ernest Dickerson, Mr. Lee's "Malcolm X" has at least four different visual tones. The early 1940s are richly saturated colors with golden, nostalgic light as we follow Malcolm's career as a hustler and pimp Detroit Red, although the onscreen portrayal of those early times is not nearly as salacious or blunt in its interracial and sexual politics as presented in Mr. X's autobiography. The mid-1940's and mid-1950s are a transition to a cold, colorless, stripped-down world as Malcolm-as-rebel and later "Satan" is introduced to the penal system as an inmate at the Charlestown State Prison in Massachusetts. "We were all victims of the American social order," Mr. Washington's Malcolm narrates during the early part of Mr. Lee's film. It is during this seven-year imprisonment phase of Malcolm's life that Mr. Dickerson's cinematography is at its finest. Shadows with smoky, cool powder blues represent the shadings and grays of Malcolm, a man who was always in transition. The latter 1950s to mid-1960s of "Malcolm X" are a compendium of visual styles. They range from the sharp golden browns and Gordon Willis-influenced darker shades during Malcolm's ascendancy as Minister Malcolm X in the Nation Of Islam under Elijah Muhammad, to bright, rich paradise-like visions during his 1964 pilgrimage to Mecca, where Malcolm became El-Hajj Malik El-Shabazz, to a faded, almost funereal, monochromatic look for February 21, 1965 at the Audubon Ballroom in Upper Manhattan. "Malcolm X" goes beyond the end of Malcolm's life to reveal the contemporary reach of his message of self-defense and self-determination for black people, and a fighter against racism. This is depicted symmetrically. Mr. Lee astutely begins his film with the oratory of Mr. Washington-as-Malcolm as he assails "the white man" for mass violence against blacks, as we view the grainy footage of the 1991 beating of Rodney King by Los Angeles police. By the end of "Malcolm X" we glimpse a young generation who identify with Malcolm and see a modern-day leader who passes the torch to them. These final scenes are sunny and rich with golden brown hues. Mr. Lee provides a quick overview of several Pan-African leaders, specifically referencing Patrice Lumumba of the Belgian Congo and Nelson Mandela of South Africa, both products of turbulent times and an inspiration to those they led. Mr. Lee's film gives audiences a complete picture of Malcolm and the events and people surrounding and shaping his life. 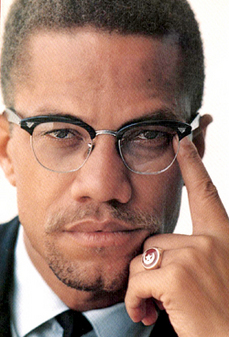 In his Nation of Islam days as Minister Malcolm X, Malcolm was feared by as many blacks in the U.S. as he was whites. 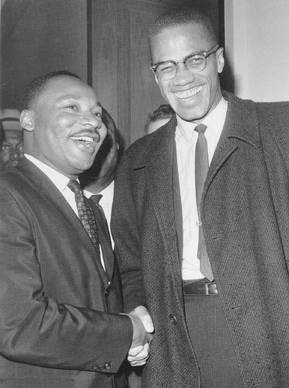 In the midst of the extreme racist climate in the U.S. during the 1960s, Malcolm's plain-spoken, fervent advocacy on behalf of black people suffering injustice, juxtaposed with Dr. Martin Luther King's conciliatory approach, made the latter more palatable to many whites, some of whom didn't care for Dr. King in the first place and viewed Malcolm as a racist. (During his Nation of Islam days Malcolm X had universally condemned whites as "a race of devils" when blacks suffered brutalities at the hands of some whites. He blasted many blacks who were reticent to fight racism and oppression against themselves in the wake of violence as "Uncle Tom." Malcolm later apologized for doing both.) Mr. Lee illustrates the contrast in philosophies between Malcolm and Dr. King, just as he did in his 1989 film "Do the Right Thing," though this time with video footage instead of photographs. References in prior films, beginning with his first feature "She's Gotta Have It" (1986) prepared Spike Lee for "Malcolm X," his sixth film. 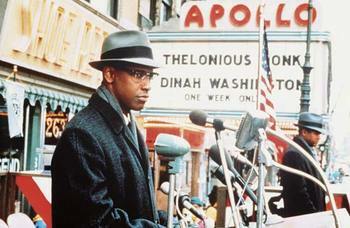 Interestingly, there are moments in "Malcolm X" that reference prior "Spike Lee Joints" and the director himself. During one of the speeches Mr. Washington sounds as if he says, "...by teaching us to love our enemy and pray for those who use us Spike Lee." The scripted line is, "...by teaching us to love our enemy and pray for those who use us spitefully." That the actor sounds as if he's saying the director's name during this moment is likely mere coincidence. (If you watch the film, be sure to listen closely to the line, which comes at the two hour, one minute and 29-second mark on the single-DVD edition.) Another apparent or accidental referencing of Mr. Lee's work comes in a hindsight moment during the eulogy sequence of "Malcolm X," with footage of the real-life Malcolm X saying the words, "you haven't done the right thing!" During a Malcolm speech delivered by Mr. Washington, there's a mention of being "hoodwinked, bamboozled, led astray." Mr. Lee took the word from Mr. X's speech and made it the title of his 2000 film "Bamboozled," in which he also shows the same clip from "Malcolm X" in which Mr. Washington utters the film's title. Triple themes or motifs run throughout Mr. Lee's "Malcolm X": fathers, numbers and gunshots. Throughout his life Mr. X had been searching for a father figure. His father had been murdered by Klansmen in Nebraska, where Malcolm was born in 1925. In the 1940s he learned the hustler way via West Indian Archie (played terrifically in Mr. Lee's film by Delroy Lindo). By the end of that decade and into the 1950s a third father, Baines (an excellent Albert Hall) triggered Malcolm's metamorphosis from illiterate to stunning orator while in prison. 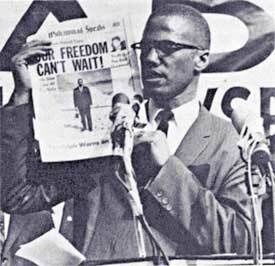 During the 1950s Malcolm found a father in Elijah Muhammad, and in 1964 Mr. X's newest father was Allah, god in the Islamic faith. Each of these fathers except the last would betray Malcolm, whether by untimely death, turncoat ways or moral indiscretions. Malcolm actually said that when he prayed to Allah during his hajj in Mecca "it was the only time in my life that I stood before the creator of all and felt like a complete human being," and the line is repeated by Mr. Washington in the film. Malcolm's father had finally been found. As a numbers runner and gambler in the early 1940s Malcolm Little had to keep numbers in his head and in Mr. Lee's film numbers are pivotal to his relationship with West Indian Archie, who advises Malcolm-as-Detroit Red to memorize numbers rather than write them down. Later, in prison Malcolm is asked by a prison warden to recite his inmate number. "I forgot it!" Malcolm says. While challenging the prison chaplain (Christopher Plummer) Malcolm-as-"Satan" quotes the Bible very specifically, chapter and verse. While Shorty (Spike Lee) and Detroit Red (Mr. Washington) play a game of cops and robbers in a park during the first hour of the film, fingers are pointed at Detroit Red and we hear the sound of a gunshot. This foreshadowing is repeated several times throughout Mr. Lee's film to represent marked time for Malcolm. When West Indian Archie meets Detroit Red and Sophia (played by Kate Vernon), Archie points his fingers at Red. We hear a gunshot. When Minister Malcolm X speaks about the 1963 assassination of President John F. Kennedy we hear several gunshots. A prelude to the 1965 assassination scene of Mr. X at the Audubon Ballroom begins with a gunshot, which introduces the song "Shotgun" by Junior Walker and The All-Stars. And during the eulogy reprised in the film by Malcolm's good friend and real-life eulogist the late, great Ossie Davis, we hear a gunshot as we see a moment frozen in time immediately after the assassination of Dr. King: three people pointing their fingers in the air. There's actually a fourth theme that runs throughout "Malcolm X": unity among people, as well as how Malcolm as a leader unified blacks who were divided amongst themselves, both during his life and after death. In the early part of Mr. Lee's film we are ensconced in American sports culture as large crowds in Harlem celebrate heavyweight boxing champion Joe Louis' victory over Billy Conn during the days of Detroit Red. The large crowds are seen again as Minister Malcolm X addresses a rally of people in Harlem. This scene repeats itself as Malcolm X gives further speeches and a demonstration outside a police precinct occurs. In Mecca on Malcolm's hajj there are shots of a large gathering of people in unison as they pray. In South Africa there are a throng of young people cheering Malcolm and on the streets of Harlem a large group of people do the same. Music has long been a significant staple of Mr. Lee's films. Some of his works have contained the full versions of songs or music to underline a scene of importance, contextualize a theme or create an anthem, and often in the third act of his films. In "Do the Right Thing" the song was "Fight The Power." In "Mo' Better Blues" (1990), it was John Coltrane's "Love Supreme." In "Jungle Fever" (1991) it was Stevie Wonder's "Living for the City" and in "Malcolm X" it is Sam Cooke's legendary "A Change Is Gonna Come," which perfectly accompanies Malcolm's march to martyrdom. This specific moment is elegiac and reverential for sure, and it crystallizes another of the abrupt winds of change to come in black political leadership in America. Much of Duke Ellington's scintillating "Arabesque Cookie" plays during readings of Malcolm's actual letters to his wife Betty during his Mecca pilgrimage as a leader of his newly-formed Organization of Afro-American Unity organization. The OAAU was a group that dedicated itself to unifying and bettering black people in America and connecting them to Africans on the continent. Music from each of the eras of Malcolm's life are well-represented, including Louis Jordan's "Beans And Cornbread," Ella Fitzgerald's "Chew Chew Chew" and Lionel Hampton's "Flying Home," as are songs from Ray Charles and Billie Holliday. Terence Blanchard's amazing music score is singular and definitive in its alternating moods of triumph, enlightenment and sorrow. The Boys Choir of Harlem vocalize moments in "Malcolm X" that sound like an orchestra of angels singing. "Malcolm X" is a stirring, thought-provoking, insightful and timeless film. It inspires discussion and encourages the reading of books. While in prison Malcolm once read an entire dictionary from cover to cover and wrote each and every single word, letter and syllable contained within it. Mr. Lee's film isn't stuck in a time warp, retaining a potent relevancy to this very day. 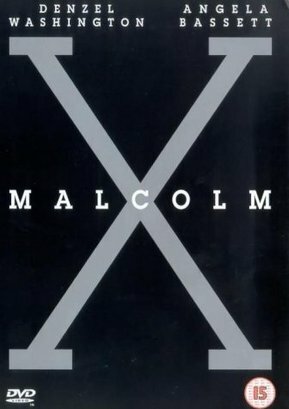 With its additional themes of the importance of language, speech, education and self-respect, "Malcolm X" is heavily layered. Mr. Lee faced enormous obstacles while making "Malcolm X," including the firing of all of his production people by The Completion Bond Company. Warner Brothers refused to give Mr. Lee a red cent beyond the film's outlined $28 million budget, so the director went to noted entertainers including Bill Cosby, Prince, Janet Jackson, Oprah Winfrey, Magic Johnson and Michael Jordan to ask for their help in funding the film so that it could be completed in post-production. After these public figures contributed, the studio again began to fund "Malcolm X," pushing aside The Completion Bond Company. "Malcolm X" was filmed in New York City, New Jersey, Boston, Connecticut, Cairo, Mecca, Saudi Arabia and Soweto. Marvin Worth and Mr. Lee produced "Malcolm X." Mr. Worth, who personally knew Malcolm, passed away in 1998. Mr. Lee and the late Arnold Perl wrote the screenplay. Yet in many instances, Mr. Lee's narrative voice is withdrawn, and Malcolm's voice takes center stage. Malcolm X was demonized in the mainstream U.S. press in the 1950s and 1960s as an angry, violent man, yet this couldn't be further from the truth. He was a family man and a fearless champion of racial justice. Mr. Lee's film shrewdly depicts much of the American press as a cynical group looking to distort Malcolm's image, though Mr. Washington's great performance doesn't reveal as much of the charisma as the real-life Malcolm exuded. "Malcolm X" is an extraordinary and profound film of one man's transformation and evolution. It's remarkable that Mr. Lee managed to condense volumes of information into a film of only three hours and 21 minutes. Barry Alexander Brown edits "Malcolm X" and its tone shifts are seamless. The film's running time goes by swiftly, and despite being an underwhelming performer in 1992 and early 1993 during its U.S. theatrical release, "Malcolm X" more than stands the test of time. One of the most stunning things of all is to watch the film's closing credits. Note the sheer breadth of notable cast members and the sound of Aretha Franklin's phenomenal voice. Anyone who hasn't seen "Malcolm X" should. It's a great education into the metamorphosis of a man, as is the must-read Autobiography of Malcolm X.